The praying mantis can camouflage perfectly into an environment of sticks, bark, leaves and flowers. The mantis is almost 4 inches long, with forewings folded against its long body, a triangular head that can swivel 360 degrees and large, compound eyes. It can fly, but prefers to walk and move slowly among foliage while searching for prey. The mantis quickly seizes its victim with its long, front legs, holds it securely and devours it. The praying mantis mimics plants in order to hide from predators and prey. It can easily blend into an environment of leaves, sticks or flowers. 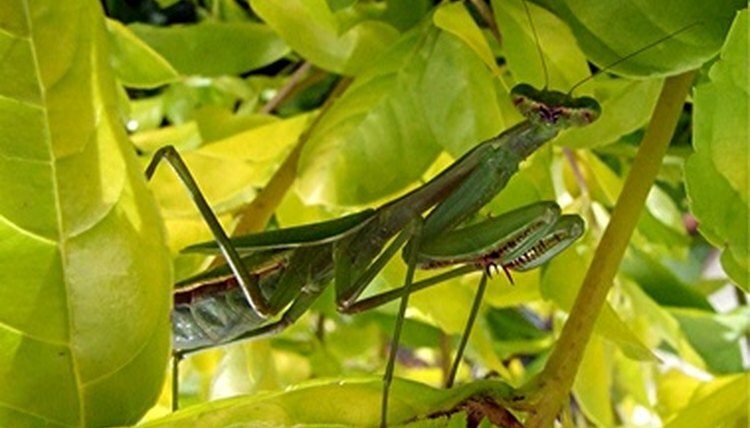 Mantises can be green, brown or a combination of colors to match their environment. It will molt every few weeks, and can then take on the colors of its natural surroundings. A praying mantis might even mimic the charred remains of sticks, weeds and grass after a fire. Swaying repetitively from side to side is a common camouflage behavior of the praying mantis. It might be used to mimic the swaying movement of vegetation in the wind. The praying mantis will eat bees and should not be kept near a hive.